It has been a lovely to have my sister with us for Christmas - and now 2008 seems to be rushing to a close - where did it go? I would like to claim that this has been the fastest (but a very happy) year of my life! Thank you to everyone for your support and encouragement during my crafting exploits in 2008 - I want to wish you all a very Happy New Year. Here is a little mosaic to reflect on what has been a busy and I hope a productive 12 months. And I am now looking forward to see what 2009 has in store for the bunnies in the Rachael Rabbit Workshop! Wow! 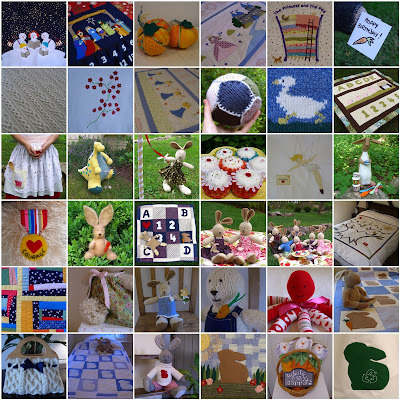 So many lovely things made in 2008! Love your bunnies! Can't wait to see what is in store for 2009! An impressive list of beautiful things. Happy New Year Rachael, I hope the coming year will be a wonderful one for you and your husband. Sometimes Friends Ask You to Make Silly Things! What is at the top of your tree?